Recently DB Sports Tours helped send St. Kevin’s Boys under-12 side to England to go to Old Trafford, take in a Premier League game, hear from a Man United scout and more. The boy’s weekend away began early on Friday morning, with pick ups at 6.20am. From there they made their way to DublinPort and make the journey across the Irish Sea. Having arrived early in Holyhead it remained all steam ahead as they travelled through the Welsh valleys to Manchester. When the group arrived in Manchester their weekend really began, having lunch in the Red Café then going on a guided tour of Old Trafford; taking in the history the iconic club’s massive success. In the evening the boys took in the wisdom of Manchester United’s head scout Derek Langley. The next morning they got to test their wits against Sale Communities in a 9-vs-9 game in which they were reportedly far the better side. 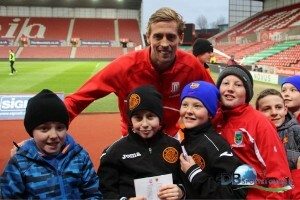 Following that it was on to The Britannia to take in some Premier League action between Stoke City and Hull City, in which the home side won 1-0 as Peter Crouch scored late on as a super-sub. A relaxing evening ensued in which the group were involved in a swimming session before and early night with Sunday’s excursion’s to follow. Sunday began swiftly with a 7am breakfast followed by training at the Platt Lane training facility in Manchester. Soon it was time to make their way back to Holyhead after a memorable and ultimately worthy experience which the team will hopefully grow from.